Batchoy is Filipino pork innards soup that consists of pork meat, pancreas or lapay, liver and kidney and mixed with chili leaves. 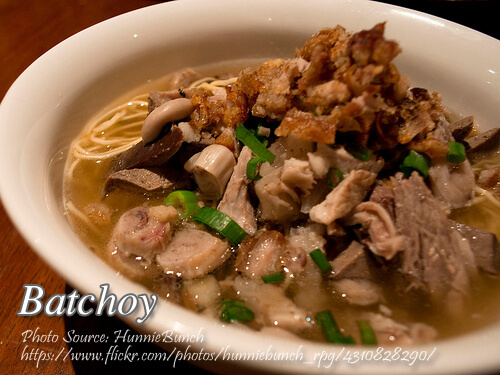 This is I think is the only known batchoy ever since specially in the tagalog region. The version that are being served in our family when I was a little kid contains misua and patola. I think that is no the original version which only contains pork innards. There is also the batchoy tagalog that contains pork blood and misua noodles. But it depends on the individual if they like to eat pork blood because some people abstain from it. To cook batchoy; Fry sliced pig tenderloin. kidney, liver, lapay until brown and set aside. Saute garlic ginger, and onions and mix to meat mixture thoroughly and cover. After 10 minutes, add enough stock or water to cover and boil until meat becomes tender. Add sili leaves and remove from heat. Serve hot. Fry sliced pig tenderloin. kidney, liver, lapay until brown and set aside. Saute garlic ginger, and onions and mix to meat mixture thoroughly and cover. After 10 minutes, add enough stock or water to cover and boil until meat becomes tender. Add sili leaves and remove from heat. Serve hot. Good for 4 persons.